Could Some Midwest Land Support New Biofuel Refineries? Land that isn't in good enough condition to grow crops could be used to produce substantial amounts of liquid biofuels, a new study claims. But there are many concerns about the study, and about the future of advanced biofuels in the U.S. and abroad. The gas you put in your car is already 10 percent ethanol, and that ethanol comes from corn. The 2007 law requires refineries to start using ethanol from sources that aren't grain crops. The overarching goal of the law is to import less oil and reduce carbon emissions. But that's more easily said than done. For one thing, if you take farmland currently used for food and instead plant crops for fuel, you reduce food supplies and drive up prices. That could also encourage farmers elsewhere to chop down carbon-rich forests to plant more crops, and that's bad for the climate. So G. Philip Robertson and colleagues at Michigan State University's Kellogg Biological Station have been looking at plants that don't require farm fields. "First, we discovered that the grasses and flowers that take over fields once you stop farming produce a fair amount of biomass, especially if you provide them a little bit of fertilizer," Robertson says. Next, the researchers considered the impact on climate. Would using these crops help reduce the amount of carbon dioxide that ends up in our atmosphere? "Is there truly a climate benefit to doing this, or are we just robbing Peter to pay Paul?" Robertson wanted to know. After all, if you leave those lands alone, the plants will soak up carbon dioxide and store it in the soil, and that's good for the climate. Their answer: Using these crops for fuel is much better for the atmosphere than burning gasoline. 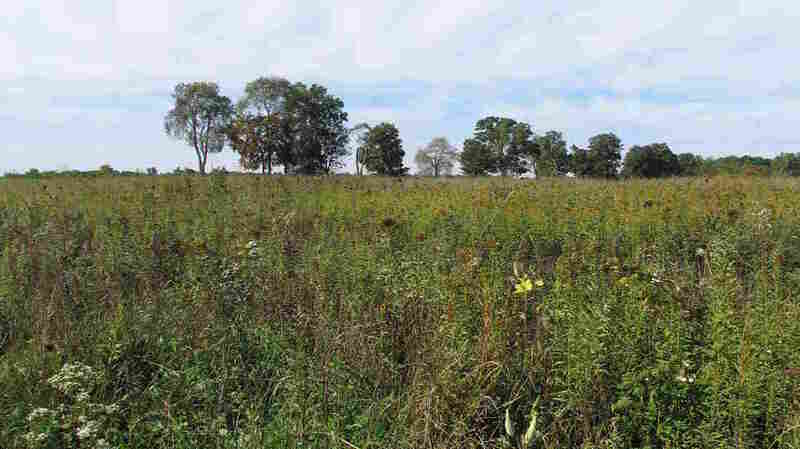 Robertson and his colleagues surveyed the Midwest acre by acre and identified 27 million acres of marginal farmland where these plants could grow, and where the acreage falls into a compact enough area that someone might want to build a refinery to produce biofuels. They figured that it would become too expensive to transport this heavy and bulky plant material more than 50 miles, from field to refinery. "At the end of the day, we discovered we could produce enough biomass to supply 30 or so of these potential biorefineries," Robertson says. 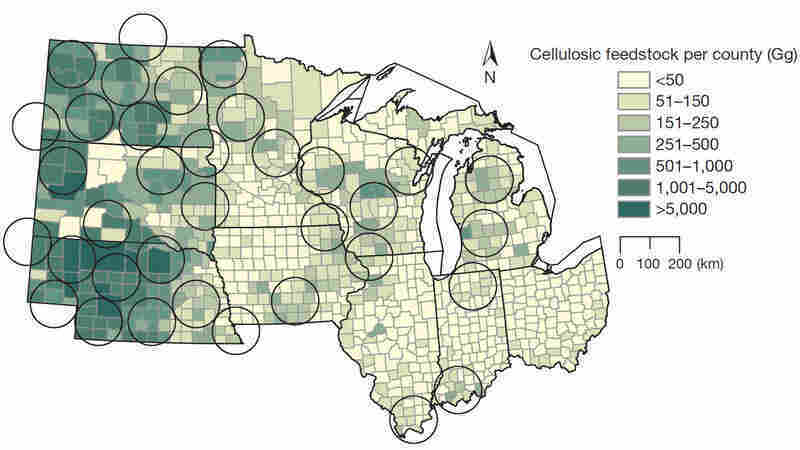 This map shows the potential biomass collection within 10 states. Each circle represents an area of about 7,800 square miles, which could produce about 23 million gallons of ethanol per year. A gigagram, or Gg, is about 1,100 tons. And he likes the idea of using marginal farmland, because the biofuels "crop" could be harvested once a year but would otherwise be left as wildlife habitat. But some researchers in the field aren't convinced the resource is nearly that big. Adam Liska at the University of Nebraska, Lincoln says a lot of this acreage is in the Great Plains, which wouldn't produce a reliable crop year after year. "One year you may have high rainfall and high crop yields and be able to sustain your facility, [but] the next year you may have a drought," Liska says. And in drought years, these very expensive refineries wouldn't have enough material to work with, and they could lose money. So Liska doubts that anyone would ever build a biofuels refinery to reap this unpredictable harvest. Indeed, Brent Erickson at the Biotechnology Industry Organization, an industry trade group, says nobody has plans just yet to use this kind of plant material to make biofuels. Instead, the young industry is eyeing other sources of material to use as a feedstock. "Every region of the country has some form of biomass — so the Northwest would have sawdust and wood waste; the California area might have rice straw or wheat straw," Erickson says. Refiners in the Midwest are looking at corn cobs, and a plant that's actually operating in Florida uses dead citrus trees. "As this technology progresses, we're going to see a great diversification of biomass supply," Erickson predicts. But biofuels could at best provide only a tiny fraction of our energy needs. Plants are very inefficient when it comes to capturing solar energy. "If you were to take every gram of crops produced anywhere in the world for all purposes — and that includes every grape, every ton of wheat, every ton of soybeans and corn — and you were to use that for biofuels and essentially stop eating, those crops would produce about 14 percent of world energy," says Timothy Searchinger, an associate research scholar at Princeton University. "They realize that it was a mistake, and their compromise for the moment is essentially to cap what they're doing, and then they promise by 2020 to phase out all government support for biofuels." But the U.S. government continues to push ahead. It may be creating a new industry, but Searchinger says it's also creating new risks.